The RCeA provides a set of online capabilities for the visualization and qualitative and quantitative exploration of a list of agriculture, socioeconomic, basic biophysical and climate data, as well as the outputs of the agricultural typologies, and economic models to download, and in doing so it reduces the workload on the data users and addresses the limited network bandwidth and latency characteristics of Africa. An initial set of 21 national eAtlases have been developed and will be managed by the Strategic Analysis and Knowledge Support System (SAKSS) platforms in countries where they have been set up or will soon be set up. 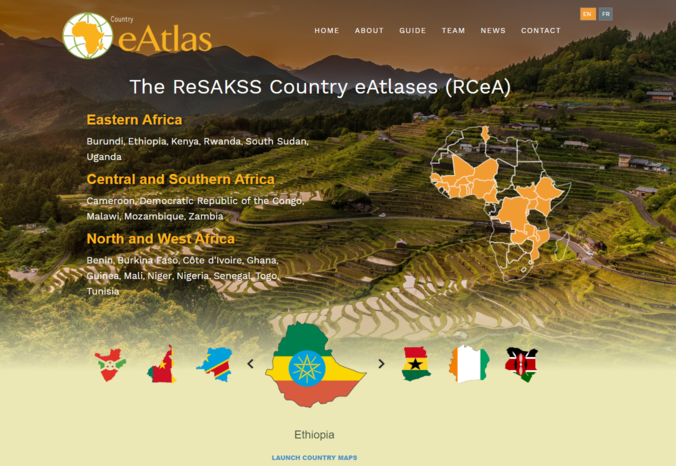 ReSAKSS is working with the local SAKSS platforms to train CAADP stakeholders on how to access and use their eAtlas as a guide to improve agricultural policies and to target and prioritize investments.